Wolletje, my sponsorsheepie in Scotland, was shorn on June 18, 2014. I now finally got the fleece in the mail – I didn’t mind waiting, because it arrived in pristine condition! 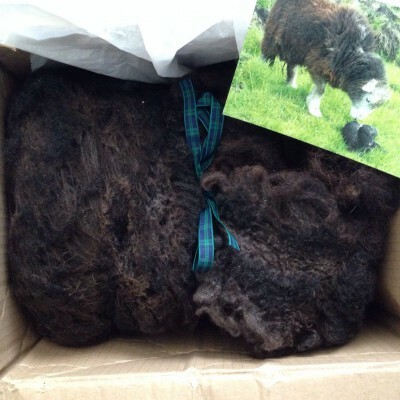 I got a nice box, containing a photo of Wolletje and her lamb, a lot of official looking papers with good info about the sheep, and, last but not least, the fleece wrapped with a pretty, tartan ribbon. 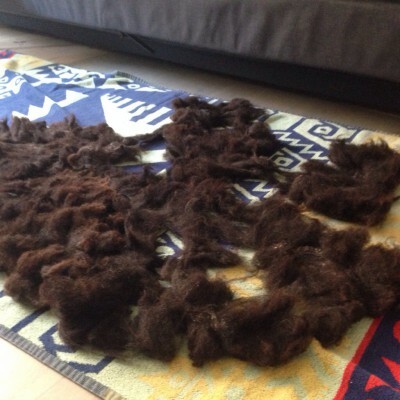 The fleece was “Skirted and tidied up”, as it said on the papers – and very well so. There was almost no vegetable matter and such in it, so it could go right in the washing bath! I’m probably doing this completely wrong, it being my first time prepping a fleece and all, but I pieced together some info from various spinning books I have, and did my own thing. As they all tell you to separate the fleece into locks and put them in mesh bags, I am definitely ignoring some info, as I simply didn’t have the patience to get hold of some mesh bags before starting! I even talked to my mom about it (hi mom! 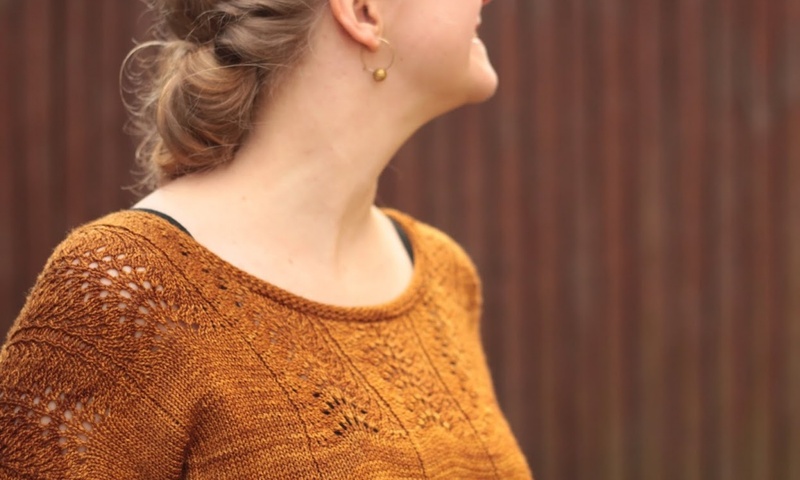 ), who said that well, I should wash it, but I would probably want to leave in some of the lanolin, as it would be good to have that during the spinning… To which my response was a horrid “No!”, thinking of keeping my spinning wheel clean of grease. I’m used to spinning nice, non-greasy and non-smelly wool tops, so I’m not scared of removing the lanolin altogether. I’m a spoiled spinner! And I very much hope my method will work as well. There’s a lovely wool “soup” there, and my bathroom smelled quite sheepy. The water turned very dark brown, so I guess it was a good thing to soak it a bit! 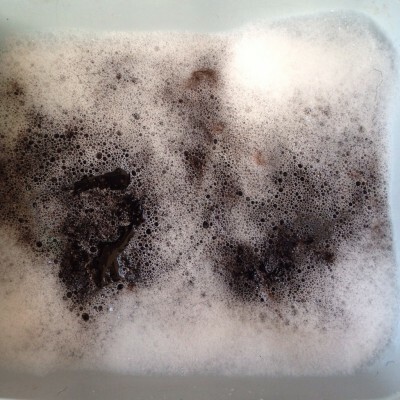 I drained the water, then washed the wool in warm water with regular dishwashing soap. “Washing” basically consisting of filling the tub with hot (well, warm, not really hot hot!) 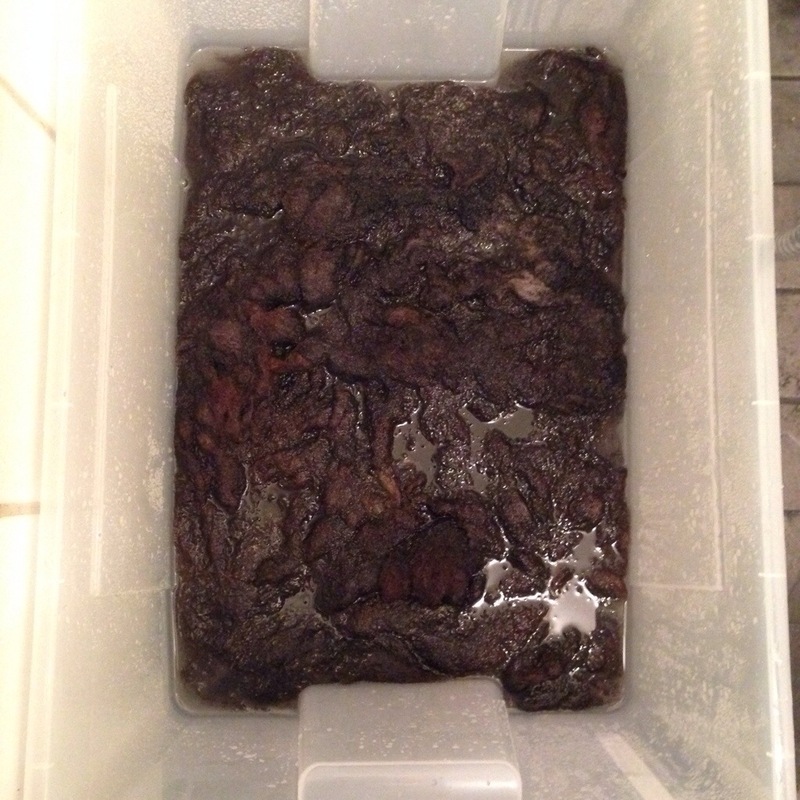 water and dishwashing soap, then adding a good portion of the fleece to it and letting it sit until the water has cooled. I then lifted it out, got rid of the quite dirty water, filled the tub with cooler, clean water, put in the wool, and lifted it out again – repeating that twice, or until the water wasn’t dirty anymore. In the cleaner water, there still were some sandy grains and kemp hairs, but I ignored that – I can manage that, as long as it doesn’t smell too sheepy while spinning it, and isn’t too dirty so my spinning wheel and hands get all black! I’ll need to find a nice, quiet area out of the sun and wind and away from little prying fingers.